Whilst Ray Mears is obviously an iconic figure in the UK with numerous BBC shows aired over the years; in Australia I think it fair to say that he is a relative unknown. Which is a pity as his bushcraft shows have obviously helped create a vibrant bushcraft community in the UK. Alas there is no such movement in Australia. The equivalent in Australia would be Les Hiddins who came to prominence with his Bush Tucker Man shows in the early 90's. I stumbled across the Bushcraft book in my local library, at first I dismissed it as I was after a more hands on approach to describing techniques. Whilst the book has ample photos it is not a manual rather a travel book describing a diverse range of cultures still practicing traditional bushcraft. After randomly selecting a page (best way to gauge a books readability) I decided to devote some time to reading this work. Ray Mears writes in a down to earth informative style. He has a knack for creating a vivid image of the characters encountered and an empathy for their world. Each chapter is devoted to a specific culture ranging from the Amazon Yekuana; African Masai, "Mountain Men of Wyoming and the Artic Sami people. If you are interested in Bushcraft and traditional/indigenous culture I can highly recommend this book. I have since ordered the TV series by the same name on the basis of this book. Hi - Love your post on the Ray Mears Survival book. I carry out work for the raymears.com website and was wondering if your blog readers would find a link to the Ray Mears website of interest. 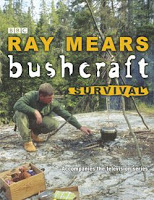 Lots of DVDs, books and all the top quality bushcraft and camping kit that Ray uses - including the Woodsman shirt. I can see that you are going to get the idea that I rubbish everyone, but not so. There are some real knowlegable people out there, but Ray Mears is not one of them. He is a good presenter, but he does not do enough research into his subject. This is clear when watching his videos. For anyone in the Northern Territory, Les Hiddins would be a good one to follow, but his research for the army was only based in the Territory, and does not relate to the bottom end.